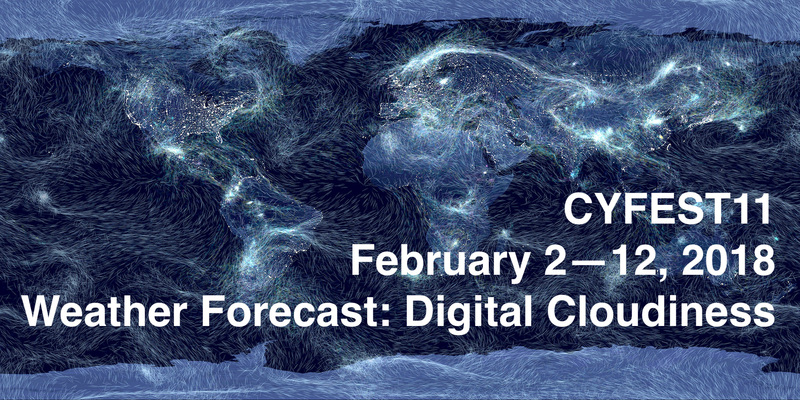 Artworks and lectures from the Leonardo Network will present at CYFEST 2018 with the theme Weather Forecast: Digital Cloudiness in celebration of the 50th Anniversary of Leonardo Journal. This year's CYFEST experience will include artwork from the Leonardo community including Managing Director Danielle Siembieda and artist Janine Randerson. Janine Randerson will present Albedo of Clouds; Danielle Siembieda will exhibit Building User Response Gadgets; and Alan Boldon will give a lecture on A Radical Approach to Learning: Facilitating Collective Intelligence. 2 PM — Workshop of Janine Randerson "Cloud Worlds: Recent Digital Art from Aotearoa-New Zealand"
Janine Randerson adopts weather as primary material for sensory experiences. This installation included the contributions of scientists, programmers, instrument technicians, social online networks and the vagaries of the weather itself. The project suggests that creative engagement with meteorological science can activate eco-political “networks” in Latour’s sense, productive of knowledge and potentially transformative. In such “meteorological art”, digital networks not only distribute facts about atmospheric data; they also generate affective forms. Weather instrumentation and media art are united in the pursuit of a creative outcome. 4:30 PM — Lecture of Danielle Siembieda "Re-imagining the Future of Collaborative Communities"
“BURG” (Building User Response Gadgets) is an artwork that anthropomorphizes a building by connecting energy systems (cold water, steam and electricity) with human-body systems (cardiovascular and respiratory systems). The overall objective for “BURG” is to create an aesthetic system for people to understand their building’s needs. Part of the purpose of the project is to design an interface for an EIS System that will ultimately lead to behavioral change or action. 6:30 PM — Lecture of Alan Boldon "A Radical Approach to Learning: Facilitating Collective Intelligence"
Alan Boldon will talk about the international network of learning labs he is establishing with partners across the world. The overarching aim of the project is to define a method for facilitating interdisciplinary and intercultural enquiry. The labs will draw together leading figures from many disciplines, worldviews and cultural backgrounds to consider some of the great challenges of our time. Working solutions to complex problems will be circulated around the network and tested out in different contexts. Founded in 2007, CYLAND is a nonprofit organization dedicated to expanding the intersection of Art :: Tech through an annual international festival, visual exhibitions, sound art, video art, and educational programming. CYFEST (Formerly called “CYBERFEST”) began their annual festival in 2007, in St Petersburg, Russia. Over the following editions, this event grew to be housed across the world's most prestigious institutions.